The weather in Atlanta is looking up. I also am quite sure that there were a few pre-Valentine's couples looking up at the romantic night sky the last couple of nights at the Fernbank Observatory. Not to worry if you missed this week's stargazing opportunity. The Observatory is open to the public (free of charge) every Thursday and Friday evenings from 9:00-10:30, weather permitting. Want more time under the stars? 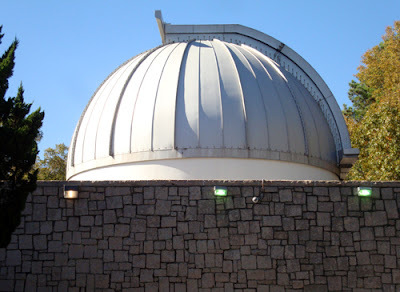 The Fernbank Planetarium at the Fernbank Science Center (which also operates the Observatory) has an 8:00 p.m. show that concludes in time for the 9:00 p.m. celestial viewing...through the largest public telescope in the southeastern United States. The Observatory is free and the Planetarium show is only $4 for adults and $3 for students and seniors...it's so great a bargain, it's practically a gift. Great place and so easy to visit. Know about the Bradley at Agnes Scott? Thanks, Terry! Didn't know about Agnes Scott's observatory. Looking forward to checking it out during the next Open House, March 25. Thanks again.